Cumin scented rice is an easy way to spice up plain white rice. Whole cumin seeds are toasted in butter with onion before the rice is added. The heat releases the oils in the seeds and awakens their flavor. You can pair cumin scented rice just about anything but an Indian curry would be especially delicious. Melt butter in a large saucepan over medium heat. Add onion and cook, stirring often until onion becomes translucent, 3-4 minutes. Add cumin seeds and cook a minute more. Add rice. Cook and stir until rice becomes fragrant and is well coated with the butter. Add salt and water. Bring to a boil, then reduce heat to low. Cover and cook until the water is absorbed, about 15-17 minutes. Remove from heat and let sit, uncovered for 10 minutes, to let the steam escape. Gently fluff with a fork and serve. 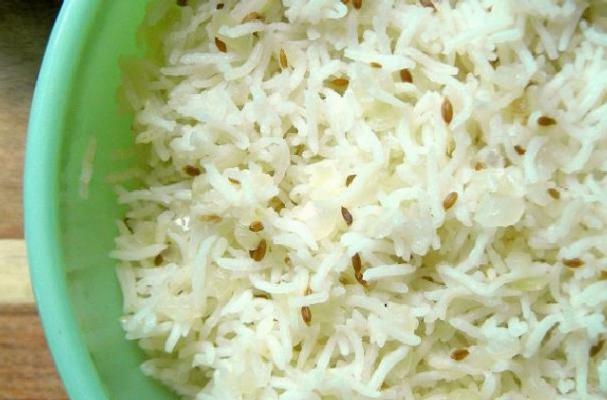 **brown rice variation: Follow the instructions for the white rice version, substituting an equal amount of brown basmati rice for the white (I find you don't really need to rinse brown rice). Increase the water to 3 cups and increase the cook time to 40-50 minutes.